A continuation of yesterday's What Nikon Got Wrong article. Products that are different than expectations tend to cause a lot of intense debate. No product is "all bad" or "all good." It's the balance of good/bad for intended purposes that makes something desirable or not desirable for an individual. I've already described a number of things that Nikon got wrong, so let's talk about what is right in the Df. Up front, we have to talk about the sensor. The D4 sensor (and the D3 sensor before it) is one that shines in a number of ways, and it seems a shame to only have it available in a body that's out of the price reach of most people. Once Nikon gave us a less pricey camera with the D3 sensor (the D700), it was inevitable that people would ask for the same with any subsequent sensors. Unfortunately, we never got a D700s (D3s sensor). But now we have a Df with the D4 sensor. There are plenty of nice things about the D4 sensor, and one of them applies to retro: of the current Nikon FX sensors, the 16mp sensor in the Df is the least likely to provoke issues with older lenses. Any D, AI, or pre-AI lens that wasn't completely telecentric in how it presents light to the focal plane simply has performance issues you have to be aware of and deal with on sensors such as those in the D800E. Indeed, I think that the D800E has the partial anti-aliasing, un-anti-aliasing filter that it does because of some of these issues: it's basically an optical trick that alters the light path slightly. But the 16mp sensor simply has big enough photosites that many of the more subtle angle of light issues just simply disappear. The 16mp sensor is probably the most well-rounded in the FX lineup, too. While it doesn't quite match the DR of the 36mp sensor at base ISO, it's close enough to be ignorable for most folk. But it's also a little better with color at higher ISO values and I think it's tuned better for indoor light, too. Moreover, if you're not going beyond 16" maximum print size, the clean high ISO pixels mean less worries in post processing. File size, too, is an issue for some, and with only one SD slot in the camera 16mp is a better choice than 24mp or 36mp. The buffer is more than enough for most folk, too, with 25 14-bit uncompressed NEF at 5.5 fps and a full 100 images for JPEG no matter what you set. It's difficult to imagine even pros that need more than that for JPEG, and six seconds or more at reasonable NEF settings ought to be, too. So I really don't have any issues with the sensor chose for the Df, and neither should you. Yes, I know some want 8 fps with that sensor in a lower cost body. Get over it. If the difference between 5.5 and 8 fps is enough that you're missing lots of photos, something's wrong. Or you really need a D4. In terms of design, the Df looks like a Nikon. While some have said it looks a bit like a graft job, I don't get that sense at all until we get to the actual in-use issues. It definitely evokes the Nikon film SLR era without going too far with that. The fact that it has a "small" grip shows that Nikon knows that the old film SLRs had a handling problem that needed addressing: you're more likely to get a strong one-hand hold on the Df than with most of the pre-F4 film SLRs. That's really necessary if you're going to doing much changing of settings, regardless of whether your eye is at the viewfinder or not. On the other hand, Nikon didn't mess up the digital controls that are still necessary or which extend this camera beyond just a basic digital point and shoot with viewfinder. Most everything on the digital side is where you expect it to be. (That, by the way, is one reason why exposure compensation being on the wrong side seems like a big goof with the added dials.) Overall, anyone who's shot with Nikon bodies for a long period of time—especially crossing the film/digital boundary—is likely to be able to pick this camera up and start shooting without too much trouble, and that's a design win. One thing that doesn't get talked about a lot in terms of design is weight. Despite a lot of metal in the design, despite the added metal dials up top, Nikon has managed to slot this camera in as the lightest of the FX bodies so far. That's where the trend line from customers says future cameras need to be, and it's where you see the computer and tablet makers going too, so it's a more generalized trend than "just make cameras lighter." I think we want that with all of our tech these days. It would have been nicer if Nikon could have chopped another few ounces out of the Df, but still, I applaud them for going the right direction here. Indeed, one of Nikon's marketing points for the camera is "The Df is designed to travel." I agree, but it could have trimmed down just a little more and it would have really spoken to that point. Still, keeping weight down was one of the good things that Nikon did with the camera. While it's still a bulky FX DSLR, it doesn't have a bear belly. Visually, Nikon also managed to trim the perception of bulk, too, by disguising the basic body shape with more nuance than just the typical rounded edges of the other DSLRs. The removal of video is certainly a controversial topic for some, but I think this is something that Nikon got right in the broad sense. Despite Nikon's uncompressed HDMI on the D4 and D800, they aren't winning the video game. You don't buy into Nikon over the competitors for the video. Nikon's heritage—despite dips into Hollywood with lenses and filmmaking with Super 8 and video with D-Movie—is much like Leica's: strong, well-designed still photography machines. I like the fact that Nikon has tried to return to what they were known for: providing some of the best still photography tools for great shooters. Canon's most long-lived reputation—pardon my broad generalization here—came mostly with their targeting consumers first amongst the film crowd with the Rebel and getting very good at marketing. Nikon's attempts at getting the photography first marketing message over, however, don't quite hit the point strongly enough. The three interviews they've posted are with folk who've been shooting with Nikon from deep into the film days to present. Those interviews didn't quite lock in the "I've shot Nikon from film to digital because they were the tools that enabled me" point that needs to be made. Thus getting across the chasm to the Df marketing claim gets a little tougher. None of the three photographers seems to have a clear articulation of how the Df pulls all their film and digital Nikon camera experience together, yet I'm sure it does. The "pure photography" slogan isn't quite on mark, either. What Nikon is really trying to say is a variation on "we've made and continue to make the tools that enable great photography." The "pure" in Nikon's campaign is really about a focus on still photography. That's exactly right for them, I think. At least until they can prove they can leverage a significant portion of the video market away from someone. But with Sony, Canon, and others now doing dedicated video cameras with large sensors, it'll be tough to do that without a video camera from Nikon. Thus, a return to still photography focus is a good decision on Nikon's part, and one I welcome. I just want them to get even better at delivering the message and refining the products that back that up. Finally, there's one other thing that I think Nikon has got right that's not being talked about correctly by most folk. One common reaction to all three of the last Nikon DSLR introductions has been "is that all they could do" or "where's my D400?" As I've written before, I think to some degree that's intentional on Nikon's part. First, if you don't keep showing that you're iterating in the brutal camera market, you'll get even more abandonment (leakage) than you already have. We're very quick to judge in the Internet age. When we see companies that were in motion seem to stop all motion, we immediately conclude they're dead. The D5300, D610, and Df all share something, I think. They all seem like Junior Design Team efforts. They don't really push Nikon's products particularly far. A lot of what those products are is parts recycling and modest iteration. Like I said, Junior Design Team work. But that begs a question: what's the Senior Design Team doing? I don't believe Nikon executives and management to be fools. Sure, they don't listen enough to their customers, they're too conservative in many respects, and they are Japanese, not global. But consider this: I saw the camera market declining very early. I first called peak sales would happen in 2010 way back in 2003, and as we hit the point where the camera companies were having to force product into the dealers' and customers' hands, I started writing about the inventory issues and future sales decline actively on the bythom site. It took a couple of years for the rest of the press to catch on to my message, but what about the camera makers? Let's give Nikon management a little respect for a moment: they saw the same thing. If they continued to just do their iteration thing as usual out into 2013, 2014, with a new generation triggered by a D5 in 2015, they would see sales declines. While I poke at the randomness of the Nikon 1, Coolpix A, and Df, I suspect that some of this is just green-lighting projects that will continue to make it look as if Nikon is exploring the full breadth of cameras while something else is brewing in the back rooms. Note, too, that the Coolpix parade slowed this year. We're seeing very minor and very selective iterations there at the moment. I strongly suspect that Nikon is scrambling behind the scenes for another big, somewhat disruptive launch. To save compacts and nurse them back to growth, they need a new focus. To save DX and nurse it back to growth, they need a new focus. Ultimately, they'll need to do the same thing with FX, though for the time being they're actually seeing some modest growth there due to all the recent iterations in the US$3000 and under realm. But truly disruptive moves take some time to refine. I actually think Sony moved too fast on many of their recent thrusts (QX, RX, NEX, FE, and SLT). There's a lot that's too rough at the edges or missing in some of those products and we're now being conditioned by Sony to expect yet another approach every six months. A better idea is to keep the modest iterations going until you have a real disruption that you've spent the time to nail down completely. The problem is that if you just get half way there, as Sony has on some of their recent products, all you do is give the rest of your competitors a better way to gauge what resonates and what doesn't and focus their own response. A response that will come about the same time as you get your own products refined. So I think one more thing that Nikon might be getting right is this: most of their top designers seem to be missing in action on the recent cameras, which I take to mean that they're working on something bigger and much more interesting. It's okay, therefore, if the Df is a short term stand in (and it may be more than that; we'll see when we it gets delivered to customers). Which brings me to the final thing that Nikon did right: the Df isn't a camera people need, it's a camera that people want. Wants factor very high at one time of year: Christmas. The Df is just in time to deliver on that. I can see some well-heeled married couples where one says casually to the other after reading about the Df "gee, that looks like something I'd want" and then the spouse makes that their present this year. I expect the Df to be in short supply for awhile. From all the reactions I've gotten, yes probably 75% of them are on the negative side, but that also means that 25% have been on the positive side. 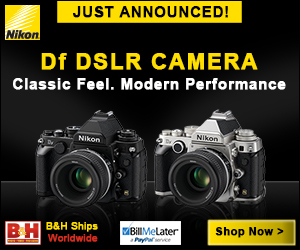 Nikon will sell a fair number of Df cameras, so we need to give them credit for doing that right, too.